Best Eiffel Tower Theme Home Decor! 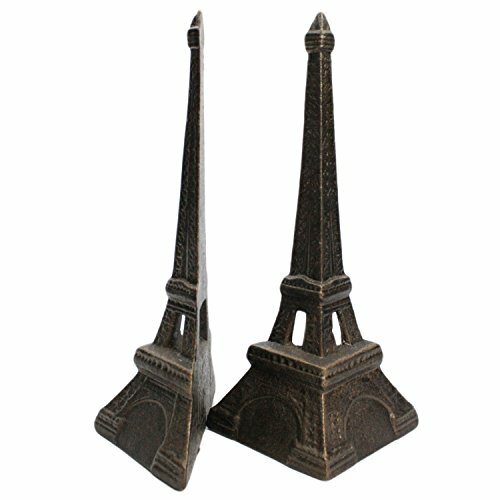 If you also LOVE the Eiffel Tower and are looking for some unique Eiffel Tower pieces to have in your home, I believe you are going to like this page! 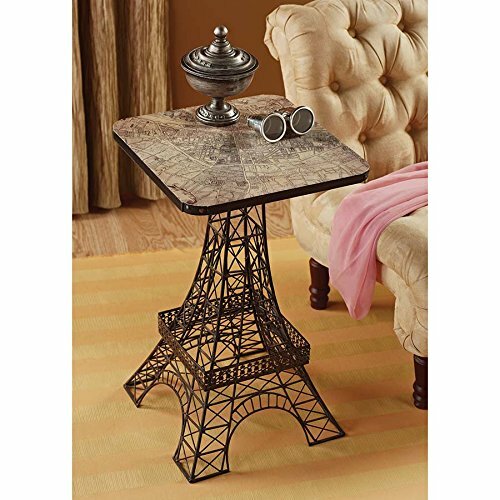 *How awesome is this cute Eiffel Tower table? Whether you are looking to create a whole room filled with Eiffel Tower decor pieces or you want to find a good Eiffel Tower gift idea for someone, I think I can help you! My favorite pieces are the most unique ones, of course! Stick around and let’s travel to Paris ‘virtually’ together! Beautiful and Unique Eiffel Tower Trunk! Great piece to have next to some Eiffel Tower wall stickers, for example. 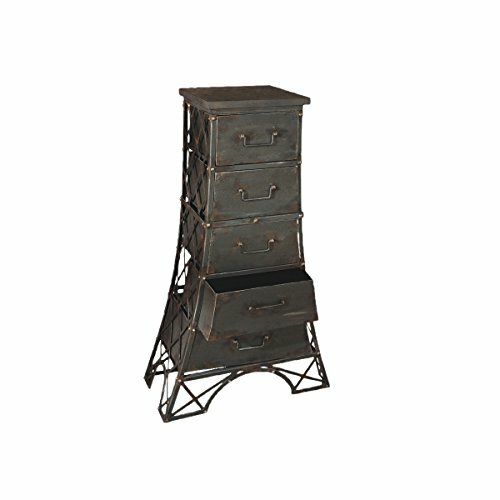 A very cool 5-drawer Eiffel Tower design metal dresser! Very rustic and vintage looking, with a very cool black finish. Will look very beautiful in your Paris themed bedroom! 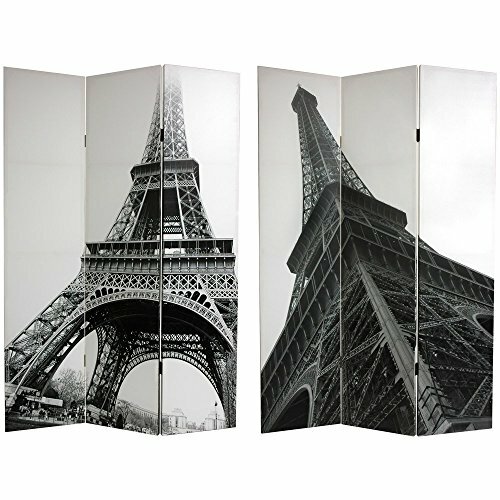 This beautiful Eiffel Tower room divider is another great Paris themed home accessory to have! This one is double-sided and it is in black and white. You can have it in your living-room, home office or in your bedroom! 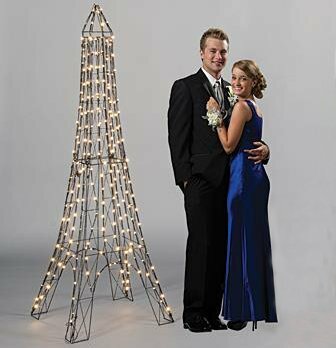 7 Feet Tall Eiffel Tower Metal Sculpture with Lights! Well, if you can’t go to Paris, then bring Paris to you! 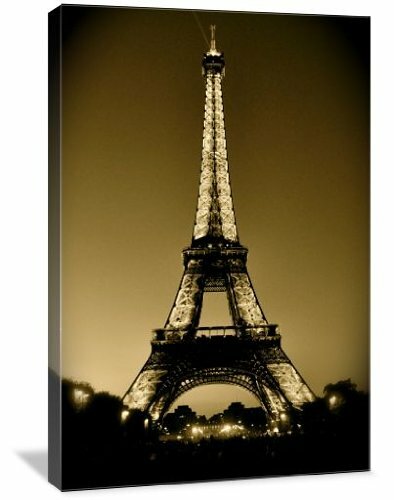 Another ultra-cool Eiffel Tower home decor piece for sale! It’s a gorgeous and very tall Eiffel Tower sculpture made of metal! How pretty and unique is it? Another great way to add a ‘Parisian’ look to any room in the house is to add a beautiful Eiffel Tower print! This is a stunning Eiffel Tower at sunset wrapped canvas wall art! You can choose among five different sizes and prices. Great print to have above your couch in the living-room! 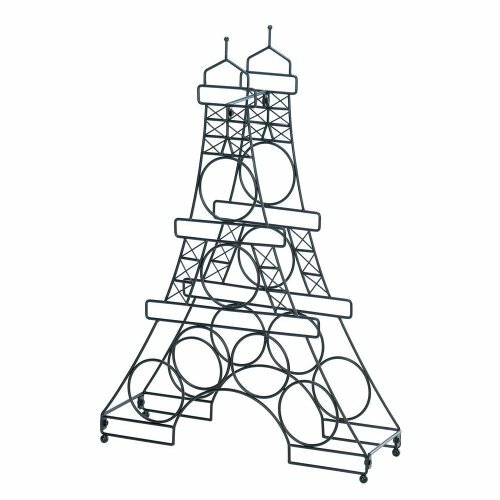 This is a fun and creative Eiffel Tower shaped metal wine bottles holder for sale! It fits six bottles of wine! Perfect Paris gift idea for anyone! **Want one? Just click on the picture! Another cool Eiffel Tower decor idea is Eiffel Tower bookends! These have a beautiful bronze finish and they are made from iron! Very attractive and also affordable! 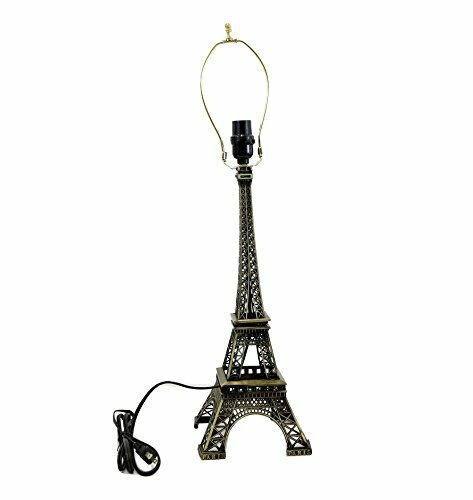 A cool and fun Eiffel Tower table lamp is also a great decor piece to have anywhere you want a ‘dash’ of Paris! I love this cool Eiffel Tower copper table lamp! 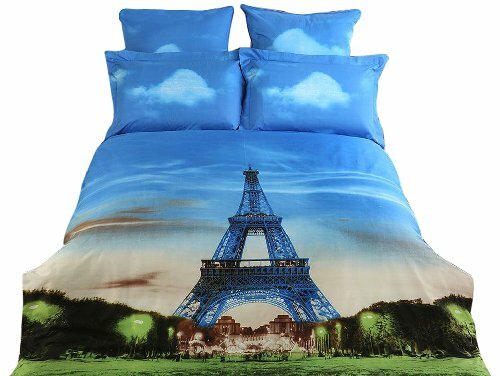 This is the most beautiful Eiffel Tower bedding set I have ever seen! I know you will agree with me! It is a 6-piece king size duvet cover set made from 100% cotton! Every night will feel like sleeping in Paris, under the moon and stars! 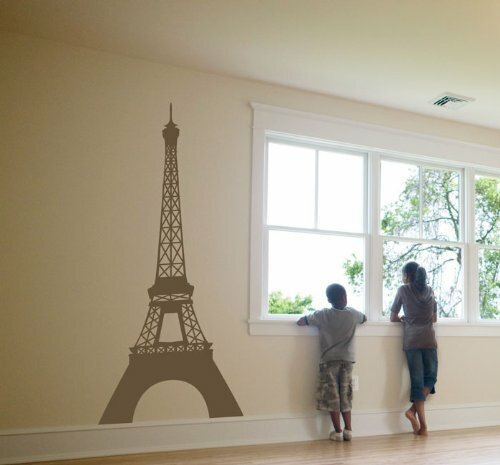 I had to show you this cool and very large Eiffel Tower wall decal too! Look how beautiful it looks on that bright room! It’s also available in several cool colors and five sizes! 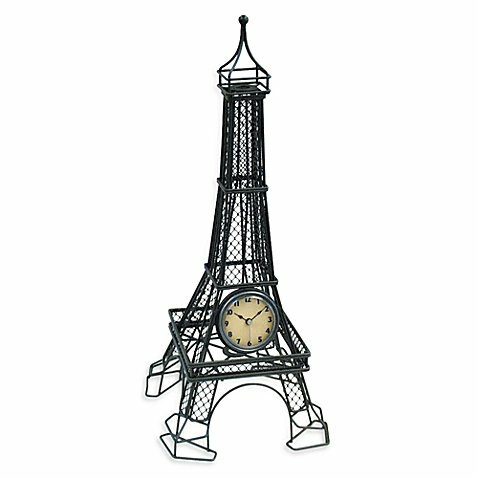 How about getting a cool Eiffel Tower metal table clock for your home? I think it’s a great Paris decor piece too! Cool Aluminum Eiffel Tower Statue! 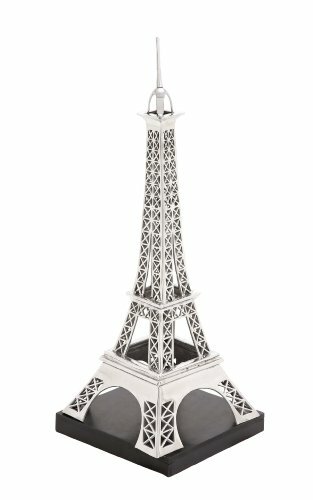 One of the best Eiffel Tower decor pieces, in my opinion, is an Eiffel Tower replica! This is a gorgeous Eiffel Tower floor statue! It is also fairly tall, at 42 inches high. It is perfect to have next to your couch or armchair! It is made from aluminum. I love your site. I’m obsessed with the Eiffel Tower I have a lot of items. The table is beautiful the wine rack looks good too thanks for your site.